Mariacristina is the gatekeeper. If you want to visit, contact her with a suggested day and time and she’ll let you know. Please remember Mariacristina has a full-time job, though, so be patient. If you need her number, let me know and I’ll send it to you. If she says no, there will be a good reason (I’m too tired/fragile; people are coming already; she doesn’t like the cut of your jib; etc) and that will be that. Official visiting hours are 1.30pm-9pm, but please be ready to leave by 8pm if you come in the evening. I’ll be getting tired then anyway, and Mariacristina and I need to have some time to ourselves — that hour is ours! If you can come during the daytime, please do so instead of the evening, as many friends (and Mariacristina) work office hours and are restricted to evenings and weekends. If you’re coming in the evening, please aim to come straight after work, not later. Be flexible and don’t expect much. It may be that at the last minute I need some extra treatment, or am too tired to see anyone, so understand that it’s (probably) not personal if we cancel your visit at the last minute, turn you away or ask you to leave. The treatment is going to be tough, so my sparkling conversation and rapier wit may well be dulled when you visit and there’s a good chance I’ll look really rubbish. Be ready to just sit with me if that’s all I can face. You may also have to wait, if other people are here, or make way if someone else has arrived. Please don’t come in if you have even a hint of any illness, even just a light cough etc. 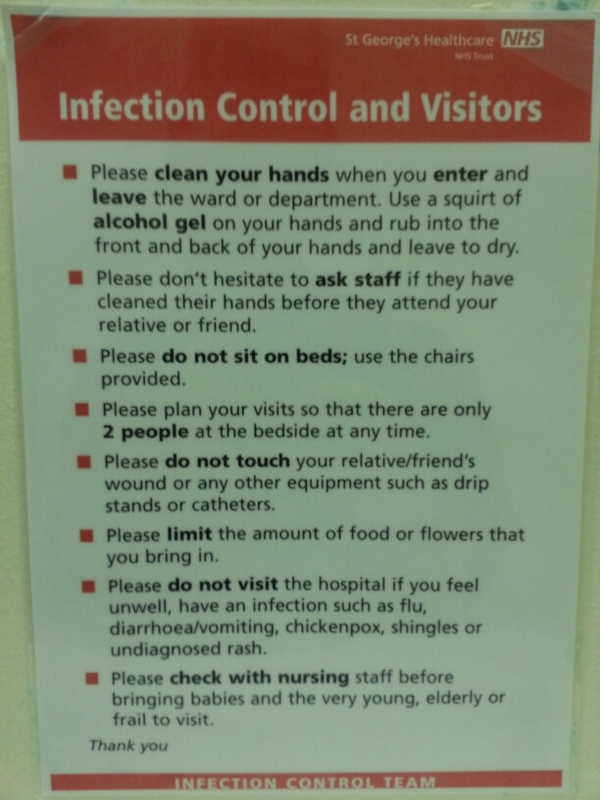 An infection could kill me, and (hopefully) nobody wants that. For the same reasons as above, there are strict procedures to follow before coming into my room. 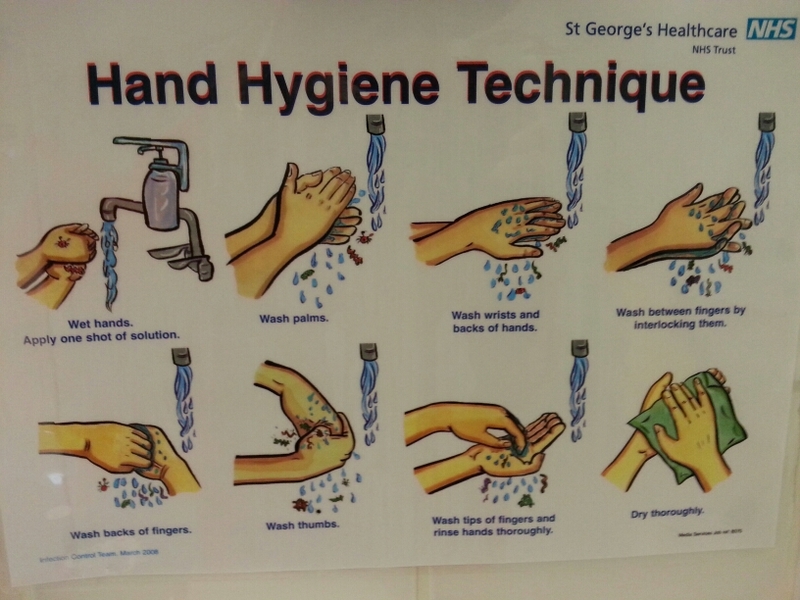 This includes washing your hands (properly — see pic) and putting on an apron, but check with the nurse and any notices whether there’s anything else you need to do. Otherwise you’ll not only put my life at risk, but also yours, as Mariacristina is likely to kill you if you fail to do this all right. LEAVE YOUR STUFF OUTSIDE! DON’T SIT ON THE BED! Apart from ruining my chic interior design, stray coats and bags in my room might be carrying bugs, which — in case you were wondering — are BAD. Oh, and the bed’s mine — if you want your own then get your own leukaemia (please don’t). NO PETS, FLOWERS OR TAKEAWAY CURRIES! Or, for that matter, any takeaways/freshly cooked food/skinless or mature fruit. Hopefully the ban on pets and flowers is obvious, but my diet will be strictly controlled to, erm, avoid bugs. I would love to see people, and very much look forward to doing so; please don’t let this put you off, but remember I’ll be getting more tired and ill and it won’t always be possible/suitable. Please respect my and Mariacristina’s (and our families’) time together, and know that I will be thrilled to see you if it works out for you to visit, but equally thrilled to know we have your support even if you’re not here in person. As you and Mariacristina know, I’m always carrying more bugs than, erm, Bug’s Life. Or is it Bugs’ Life? I’ll keep out of the way for now and let your family get to you as despite losing 8lb (insert kg conversion) I’m still the size of a bulker. Yes, I’m a maritime man now, as any true son of Pompey should be, no flying things for me. Keep your chin up mate and I’ll send some more inane drivel soon (and drivel sure beats dribble).